This week, bitcoin saw its value increase by almost $1,500 per coin. London — Bitcoin transactions use so much energy that the electricity used for a single trade could power a home for almost a whole month, according to a paper from Dutch bank ING. Bitcoin trades use a lot of electricity as a means to make verifying trades expensive, therefore making fraudulent transactions costly and deterring those who would seek to misuse the currency. "By making sure that verifying transactions is a costly business, the integrity of the network can be preserved as long as benevolent nodes control a majority of computing power," wrote ING senior economist Teunis Brosens. "Together, they will dominate the verification (mining) process. To make the verification (mining) costly, the verification algorithm requires a lot of processing power and thus electricity." Comparing the amount of energy used for a bitcoin transaction to running his home in the Netherlands, Brosens says: "This number needs some context. 200kWh is enough to run over 200 washing cycles. In fact, it's enough to run my entire home over four weeks, which consumes about 45 kWh per week costing €39 of electricity (at current Dutch consumer prices)." 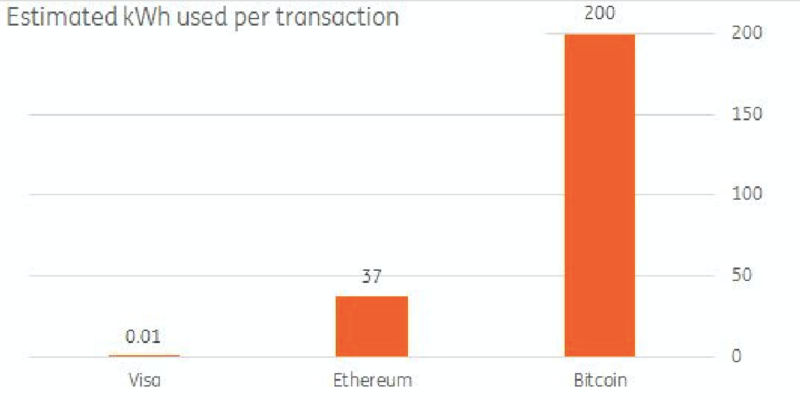 Not only does Bitcoin use a vast amount of electricity to complete transactions, it uses an almost exponentially larger amount than more traditional forms of electronic payment. This week, bitcoin saw its value increase by almost $1,500 per coin with a rally that coincides with renewed interest in the currency from investment banks. The Wall Street Journal last week reported that Goldman Sachs was looking at setting up a bitcoin trading operation, and Morgan Stanley CEO James Gorman said recently that the cryptocurrency was "certainly more than just a fad." Also this week, a team of analysts led by Gautam Chhugani and Gaurav Jangale from the research house Bernstein said that bitcoin was still just a "censorship-resistant asset class," out of the reach of state control and yet to form a part of the system of settlement and credit that defines money. "Fiat money is still the final form of settlement — governments still collect taxes in fiat money and salaries are still paid in fiat money," the team said in a note to clients on Wednesday.